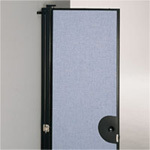 We have many options available for our Office Partitions. If you are interested in adding any of these options to your ScreenFlex purchase, please contact us at 800-978-2100. 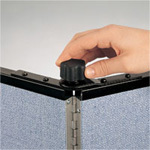 Scotchgard™ Protector can help protect your room dividers from dirt, and help to keep them looking better, longer. Set of chrome plated sash latches installed on the end frames of a Freestanding Room Divider. Utilized to create dividers of any length. *Also utilized to mount the Door. Access any room easily with the door. Self closing door swings both "in" and "out." 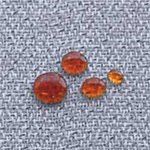 Available in 6 heights and any offered fabric color. Total width of the door including frame is 24". The same as our regular door, only featuring a 10" x 10" clear plexiglass window with black powder painted metal frame mounted in the center of any panel. The top of the Window is 66" above the floor. 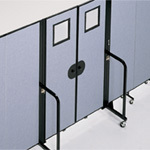 When you need to utilize your room dividers for long term use, entire semesters, office cubicles, etc., Panelocks are the answer. A simple twist of the rubber coated knob locks the panels at any angle. 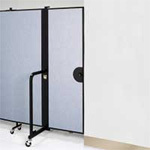 Once installed on a wall, you can attach your Freestanding Room Divider, or the Door to this innovative option. Fourteen gauge powder painted steel frame is equipped with MultiUnit Connectors.